People from mixed religious backgrounds take a variety of spiritual paths as adults, with many adopting their mother’s religion as their own, some choosing to identify with their father’s faith, and still others opting for neither. Indeed, the survey makes clear that many Americans – even among those raised in a single religion – ultimately adopt a religious identity that is completely different than the faith of their parents. But one pattern regarding the passing on of religious identity from one generation to the next is clear: Among those who were raised in a single religious background (especially within Protestantism), the family’s religious commitment is closely linked with retaining one’s religion into adulthood. Those adults who say religion was very important to their family while growing up and whose parents frequently discussed religion are more likely than others to continue to identify with their parents’ religion as adults. The remainder of this chapter provides additional detail on the current religious identity of people raised in a variety of religious backgrounds, and explores the likelihood of carrying one’s parents’ religion into adulthood. 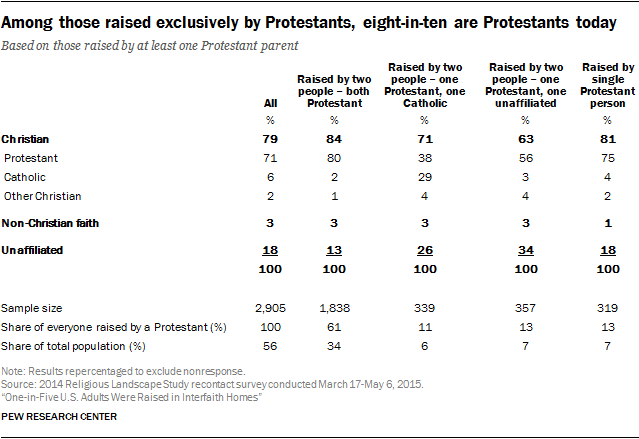 Among those who say they were raised exclusively by Protestants, roughly eight-in-ten now identify with Protestantism, including 80% of those raised by two Protestant parents and 75% of those raised by a single parent who was Protestant. Most who were raised exclusively by Protestants but who no longer identify as such are now religious “nones,” with smaller numbers now identifying with Catholicism or other religions. Among those raised by one Protestant and one religious “none,” 56% now identify with Protestantism, while one-third are religiously unaffiliated (34%). Those who were raised by a Protestant and a Catholic, meanwhile, are divided among those who now identify with Protestantism (38%), Catholicism (29%) and no religion (26%). Roughly six-in-ten people who were raised exclusively by Catholics now identify with Catholicism, including 62% of those who were raised by two Catholic parents and 58% of those raised by a single parent who was Catholic. 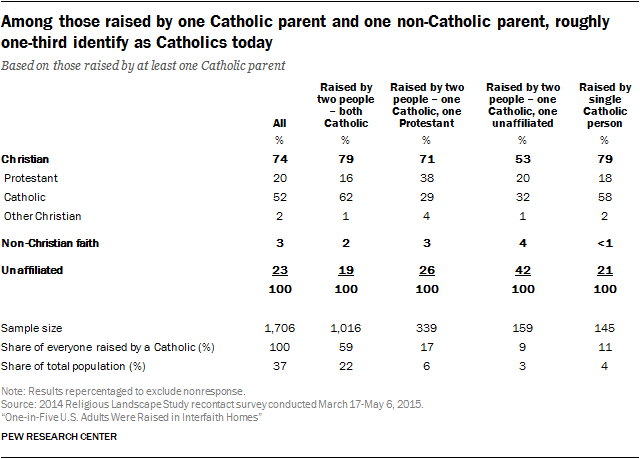 By comparison, only about three-in-ten people raised by one Catholic and one non-Catholic parent identify with Catholicism today, including 32% of those raised by one Catholic parent and one religious “none” and 29% of those who come from a mixed Catholic/Protestant background. Analysis of the data shows that among those who were raised by one Catholic parent and one Protestant parent, those whose mother was Catholic are much more likely to be Catholics as adults. 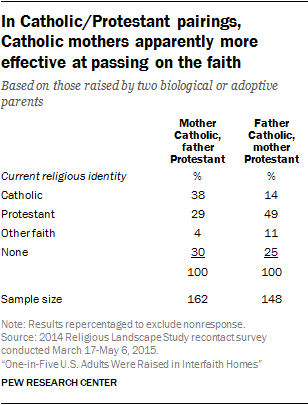 Nearly four-in-ten people raised by a Catholic mother and a Protestant father (38%) now identify with Catholicism, compared with just 14% among those with a Catholic father and a Protestant mother. Nearly two-thirds of people raised by two religious “nones” (63%) are also religiously unaffiliated today. Among those raised by one unaffiliated parent and one Protestant parent, there are more who now identify with Protestantism (56%) than as religious “nones” (34%), though just 24% identify with their Protestant parent’s denominational family (e.g., as Baptists if their Protestant parent was Baptist). Respondents raised by one religiously unaffiliated parent and one Catholic parent are now divided between those who identify as “nones” (42%) and those who identify as Catholics (32%), with a considerable minority also identifying as Protestants (20%). Looking only at those who were raised within a single religious tradition (i.e., by two people who shared the same religion or by a single parent), adults who say religion was an important part of their life growing up are more likely to say they now have the same religious affiliation as their parents. Among people with an exclusively Catholic background, for instance, three-quarters of those who say religion was very important to their family while they were growing up (73%) describe themselves as Catholics today, compared with just 38% among those who say religion was “not too” or “not at all” important to their families. Similarly, among adults with an exclusively Protestant background, nine-in-ten of those who say their parents talked a lot about religion (89%) are Protestants today, compared with 67% among those who say their parents did not discuss religion very much. Whether one was raised by two people who shared the same faith or by a single parent seems to have little effect on whether that person carries the religion of his or her parent or parents into adulthood.5 Among adults who were raised by two Catholic parents, for instance, 62% describe themselves as Catholics today, as do 58% of those raised by a single parent who was Catholic.